This blog was posted in December. 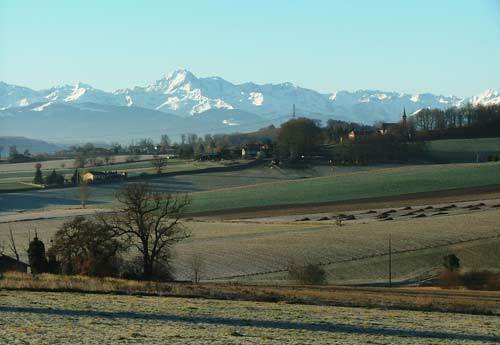 Puydarrieux is not the typical French village one would imagine. It has no market square shaded by centuries old plane trees, nor does it have a boulangerie or a bar/tabac, much to Perry’s chagrin. 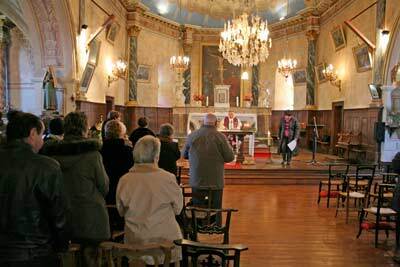 It does have a salle de fête, a mairie, as well a commemorative stone, all very characteristic for French villages. 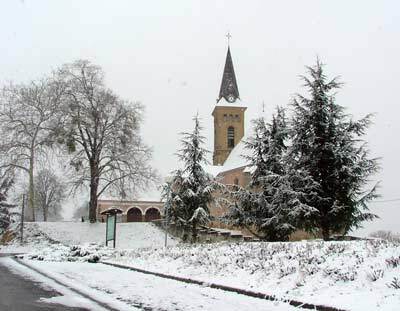 And indeed, Puydarrieux has a church, which naturally is situated on one of the highest points of the village (±400 meters). 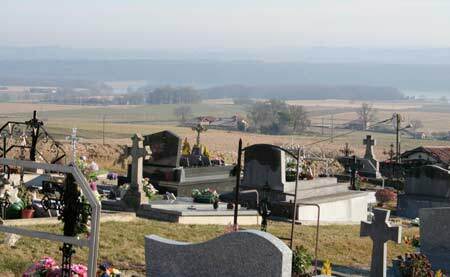 The graveyard next to it overlooks the rest of the spread-out village, as well as the magnificant Pyreneen chain. Our house is right in the middle of the picture, with trees to the right. The church, up to the right. Our house is among the trees on the far left horizon. We also learn through (or get confirmed by) the “passing knell” that someone has passed away. From the day that a fellow inhabitant dies until the day that they are buried the bells ring a different tone throughout the day. The high or low tone tells us whether the deceased was a man or a woman. This year we visited the church for the first time. Within three weeks we celebrated a marriage and attended a funeral. Whatever the reason, Puydarrieux really comes to life when there are gatherings in the church and the salle de fête next to it. 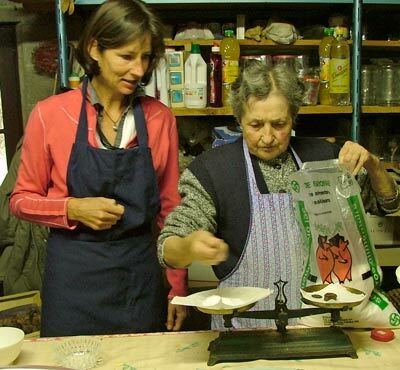 I love hearing and experiencing the tradition of the country side which includes making jams and patés, hunting for mushrooms, assisting with the preservation of porc meat, but also, in this area especially, the making of foie gras. We had the privilege of being invited last year to learn how to make it with Marie-Louise, the 80 year old mother of our friend Pierre. After having professed to being totally against the making of foie gras, I have to admit that I felt a little hypocritical accepting the invitation to help prepare and take home 2.5 kilos of cooked foie gras for our own consumption. I still think that the production of foie gras is an unnatural and cruel way of producing meat. But I have to admit that I do eat it when offered to me, since it is a delicacy and is offered to special guests. Some food for thought: the chicken, pig and cow that I buy from the butcher or the supermarket might have had a worse life than the duck! And here in our part of France "bio" is only just beginning to develop. Now that we live closer to nature and neighbours and friends with farms, we are much more aware of the different ways animals are reared for human consumption and we do try to eat more conscientiously. Stuff that turkey and Merry Christmas!